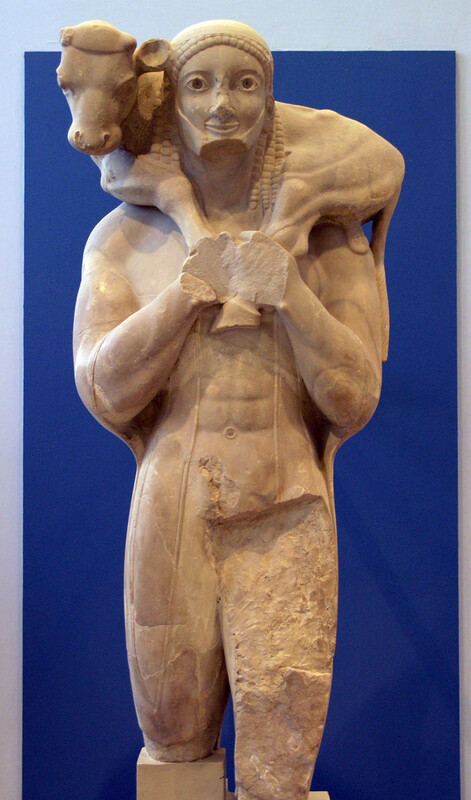 Moscophoros (Calf-Bearer), c. 550 BCE. Marble, height 165 cm (65 inches). Acropolis Museum, Althens. Image courtesy Wikipedia via user Marsyas. 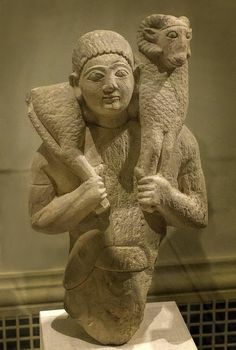 When I was an undergraduate, I remember my professor casually mentioned that Early Christian imagery of Christ as the Good Shepherd was adopted syncretically from previous Greco-Roman images of a human figure who carries a sacrificial animal on its shoulders. She mentioned this point in passing when we were learning about the Moscophoros (or “Calf-Bearer,” shown above), but didn’t elaborate further. Had I asked for more details, I’m sure that she would have then explained that the Moscophoros from the Acropolis Museum couldn’t directly have influenced this Early Christian tradition (since this Moscophoros was buried under the Athenian acropolis from the 5th century BCE until the 19th century, thereby “missing out” on the Early Christian period). Instead, she must have been thinking of similar imagery found in depictions of Kriophoroi (“Ram-Bearer”) images from ancient Greece and Rome. 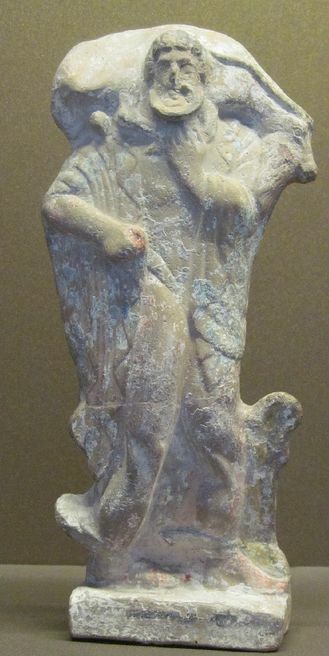 Not all Kriophoroi depict a figure carrying a ram over the shoulders, for the ram can also be held in figure’s the arms). 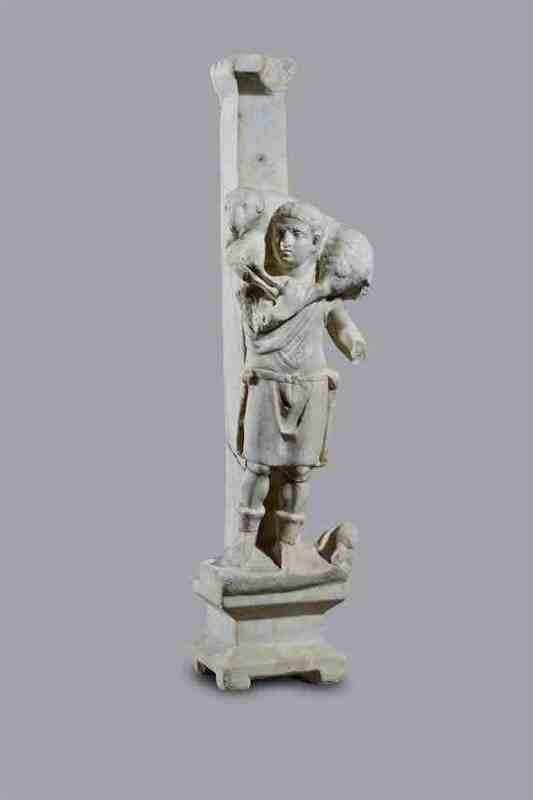 However, many of them do follow the same composition with the ram being held on the shoulders, behind the neck of the male figure. Kriophoros Statuette, Archaic Period, Crete. The Cleveland Museum of Art believes that this is an unusual example which shows the kriophoros also as a warrior. 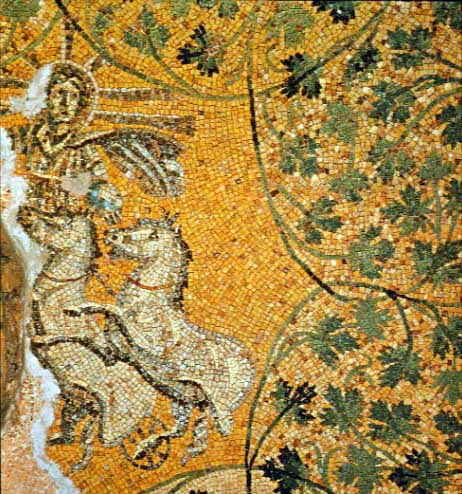 In the 3rd and 4th centuries, Early Christians adopted this imagery. However, it seems that the imagery was syncretic, meaning that the Early Christians gave the kriophoros imagery new meaning. 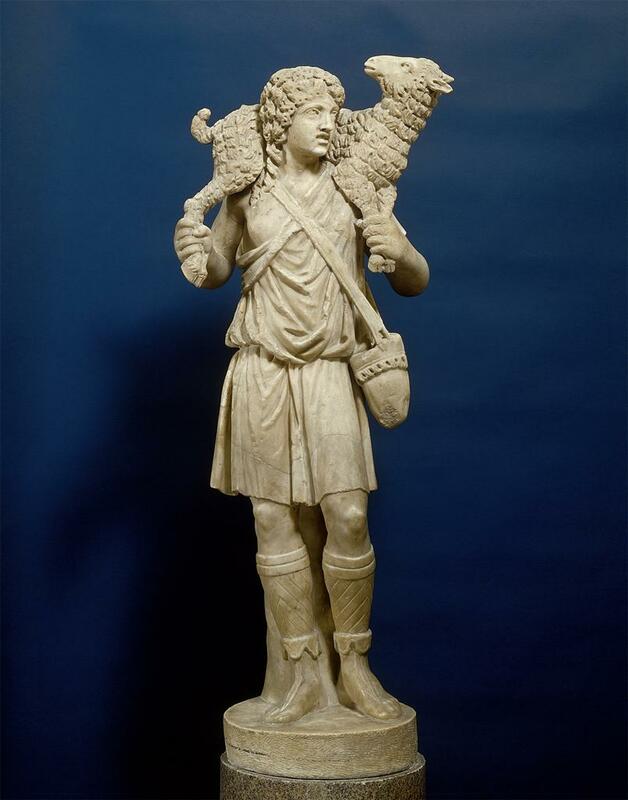 Instead of functioning as a representation of a votive figure or an ordinary shepherd, Christians used the Kriophoros to depict Christ as a protective figure who will care for his followers (his “flock”). Apart from the parable of the Good Shepherd that appears in the Gospel of Matthew and Gospel of Luke (New Testament), it is likely that Christians also were inspired to draw on shepherd imagery due to the Christian text, The Shepherd of Hermas written sometime around the early-to-mid 2nd century. In this text, a freed slave named Hermas is the recipient of heavenly messages, and he is guided and taught by a heavenly messenger who is dressed as a shepherd. Such a protective figure was no doubt appealing to the Early Christians, who were persecuted heavily before the Edict of Milan in 313 CE. With such syncretic imagery too, the reference to Christ could easily be overlooked by a Roman who was accustomed to seeing the Kriophoros in art. Do you know of other good examples of Kriophoroi, either Greco-Roman or Early Christian? Last year, in two different classes, I had students ask me about the history of the halo in art. It is an interesting topic to consider, especially since there isn’t a reference to Jesus having a halo in the Bible. I think that the closest reference to a halo in the Bible is a description of Moses being surrounded with a “crown of light” or “rays of light” (from when he came down off of Mt. Sinai, as recorded in Exodus 34:29). Interestingly, St. Jerome’s Vulgate had a translation of this verse as “horns of light,” and you sometimes see depictions of Moses with horns from the Middle Ages and onward. But that’s another story for another post, perhaps. I thought I’d write down a bit about the early sources for the halo, in case I have more students ask the same question in the future. 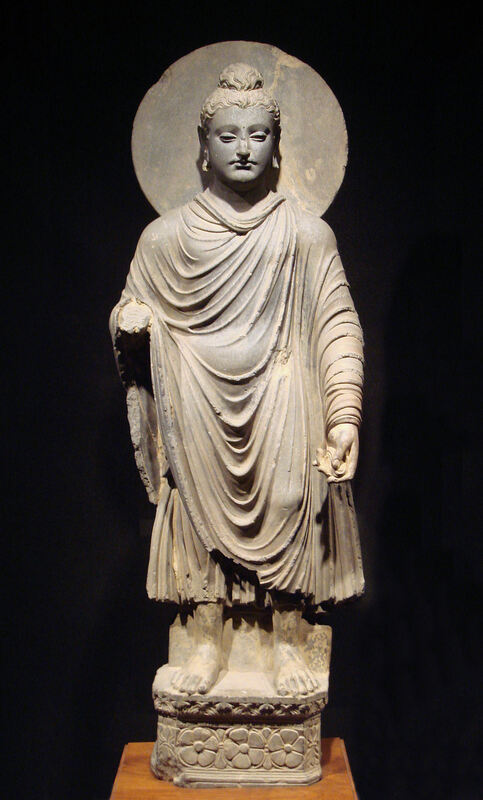 The halo may have come from several different sources, including classical culture. For example, the Greek god Helios is depicted with rays emanating from his head. 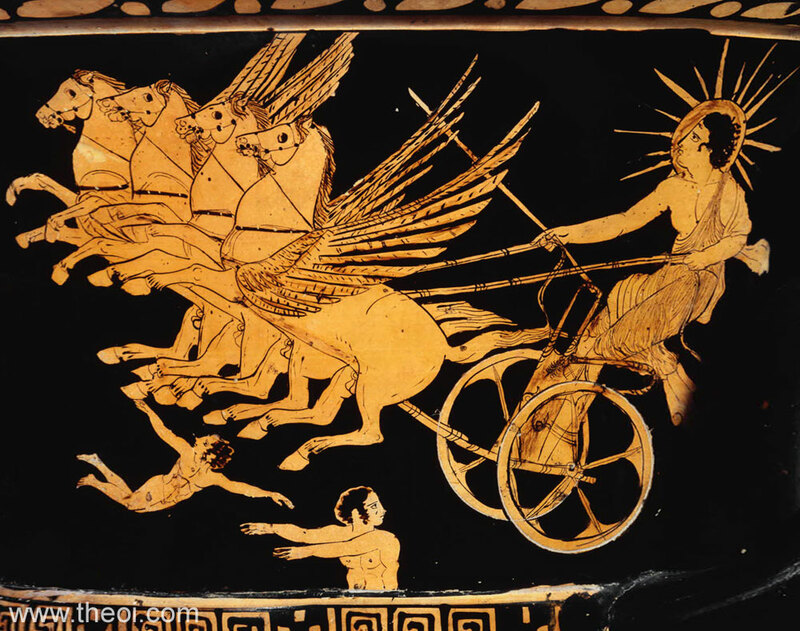 There also are a few depictions of Apollo with halos. 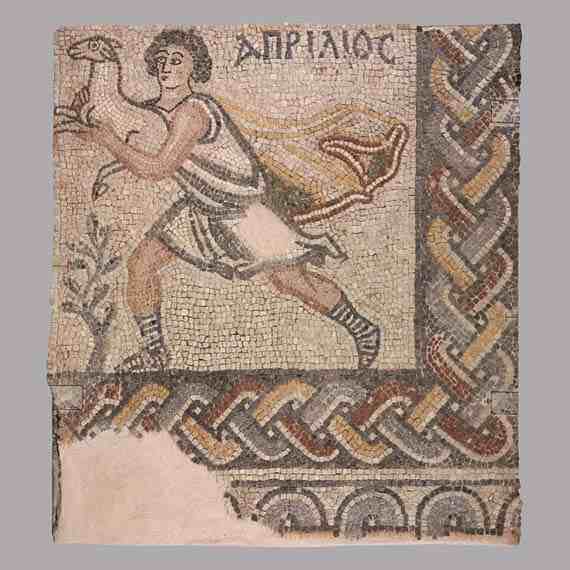 A Roman floor mosaic in Tunisia which has one such depiction. I’ve also heard discussions about how laurel wreaths (used to crown victors in classical societies) could be related to the halo. The mandorla (an almond-shaped aureole) usually is used for depictions of Christ and the Virgin. However, the earliest representation of a mandorla appears around an Old Testament figure, specifically one of the three angels who visit Abraham (in a 5th century scene at Santa Maria Maggiore).3 The mandorla continues to become more abstract and angularly defined in later art. The cruciform halo is usually used for members the Trinity, especially Christ. This form of halo includes a cross within or extending beyond the circular area of the halo. 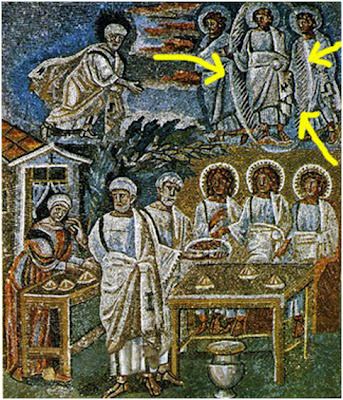 An early example of the cruciform halo is found in the Miracles of the Loaves and Fishes mosaic of Sant’Apollinare Nuovo, Ravenna (c. 504). In Orthodox and Byzantine tradition, the cruciform also include the letters Ο ὤ Ν, which translate to mean “The Being” or “I Am,” serving as a testament to Christ’s divinity (see more information HERE). The square halo was sometimes used to indicate that a person is still living when the work of art is created. From what I can tell, the earliest example of a square halo dates from about the early 8th century. The square, as an imperfect shape that represents the Earth, is used to draw a contrast with the perfect circle used for divine figures. 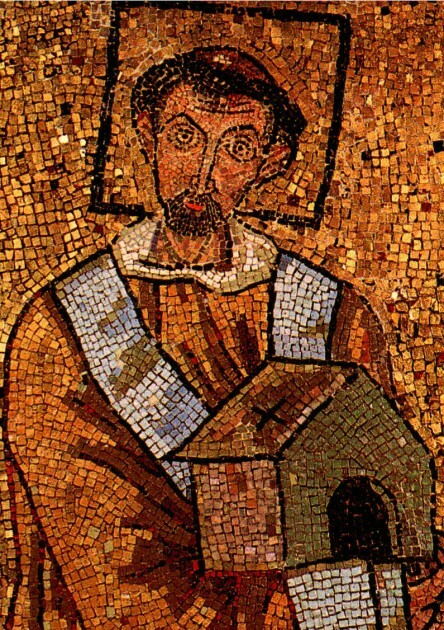 (For an example, see mosaic of Pope John VII at the beginning of this post. Other examples of square halos are found at Santa Prassede in Rome, found in a mosaic of Pope Paschal I (c. 820) and a mosaic which includes a woman specified as “Theodora, Bishop”). The trianglular halo is sometimes used to symbolize the Trinity (example: Antoniazzo Romano, detail of God the Father, from the Altarpiece of the Confraternity of the Annunciation, c. 1489-90, Santa Maria sopra Minerva, Rome). 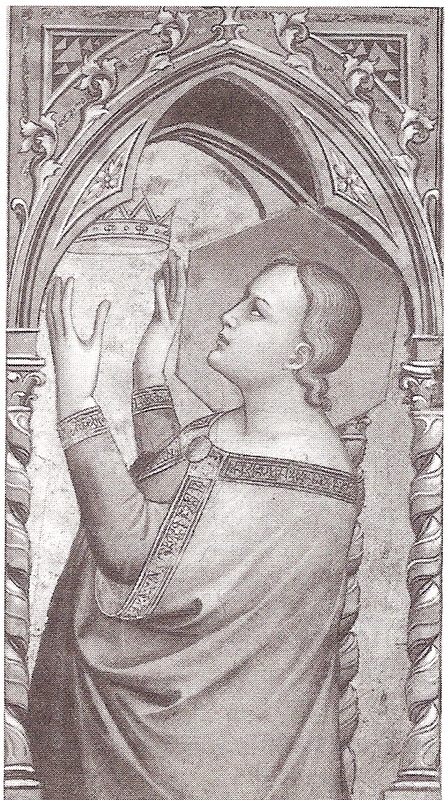 The hexagonal halo has been used in conjunction with allegorical figures (example: Alesso di Andrea, Hope, 1347. Pistoia Cathedral, Pistoia). 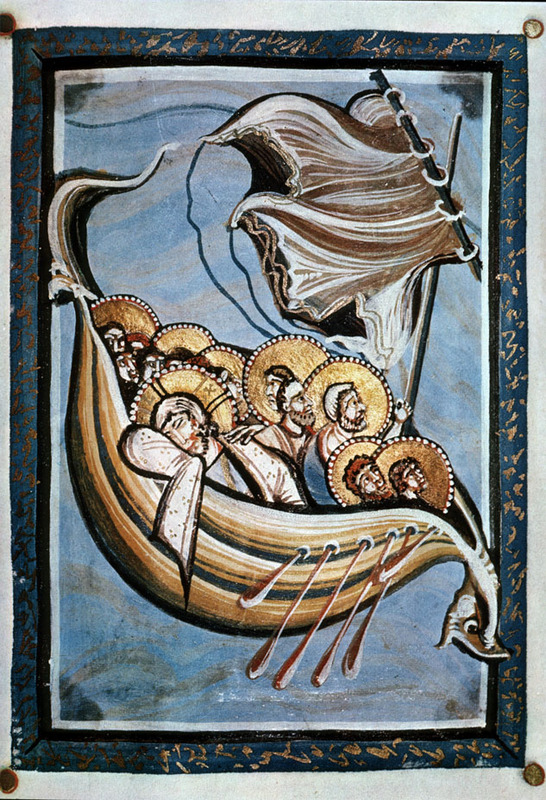 Dotted halos sometimes appear in Crusader art; they are considered one of the stylistic characteristics of this type of art (example: Saint Sergios with Female Donor icon, c. 1250s).4 The dotted halo also appears in other artistic traditions, too, including Ottonian art (example: Christ and the Apostles on the Sea of Galilee from the Hitda Codex, c. 1025-50). The star halo sometimes appears in depictions of the Immaculate Conception. This type of halo refers to the to the description of the Virgin being crowned with twelve stars (Revelation 12:1). 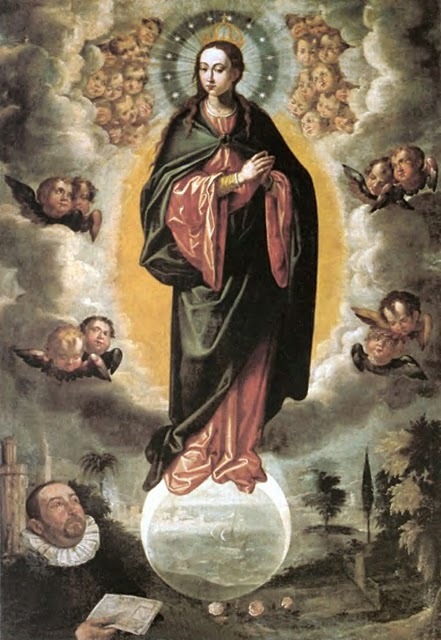 Several depictions of the Immaculate Conception appear in Counter-Reformation art, including Velasquez’s The Immaculate Conception c. 1619 and Francesco Pacheco’s Immaculate Conception with Miguel Cid, c. 1621 (Seville Cathedral). With the rise of realism in Renaissance art, the halo began to decrease (in terms of size and frequency of use). Giotto seems to have struggled with how to depict groups of figures with halos, while still giving a sense of three dimensional space, as seen in his Madonna and Child altarpiece. Masaccio tried to angle his halos to appear a little more realistic in three-dimensional space, as seen in his “Tribute Money” fresco in the Brancacci Chapel. Leonardo da Vinci only subly suggests a thin halo in many of his paintings, like Virgin of the Rocks at the National Gallery in London. In some Renaissance art, sometimes the halo was subtly incorporated into a scene, like the a firescreen (Follower of Robert Campin, Virgin and Child Before a Firescreen) or an architectural device (Leonardo da Vinci’s Last Supper). 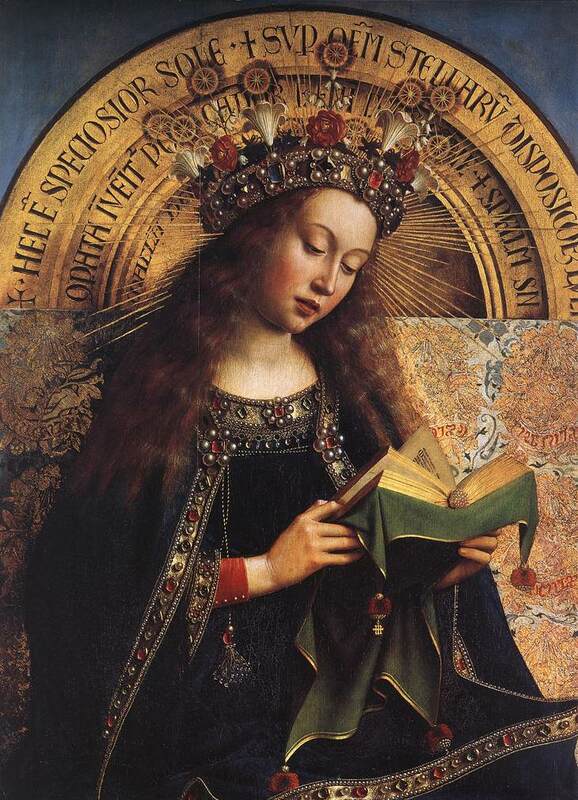 I like how Jan Van Eyck created thrones in the Ghent altarpiece with backs that give the suggestion of halos (see above). 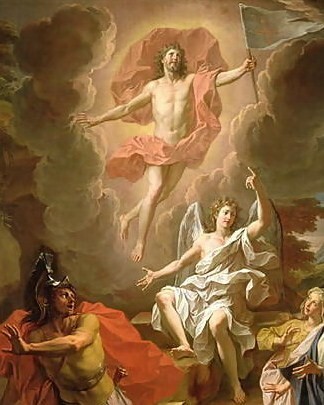 Beyond the Renaissance, some artists continued to suggest halos without creating a traditional halo, as seen in the drapery behind Christ in Coypel’s The Resurrection of Christ (1700). What are your favorite depictions of halos? Why? 1 Sally Fisher, The Square Halo and Other Mysteries of Western Art: Images and the Stories that Inspired Them (New York: Harry N. Abrams, 1995), 92. 3 “Mandorla,” Encyclopedia Brittanica. Available online: http://www.britannica.com/EBchecked/topic/361739/mandorla (accessed September 19, 2013). 4 Angeliki Lymberopoulou, “To the Holy Land and Back Again: The Art of the Crusades,” in Art and Visual Culture 1100-1600: Medieval to Renaissance, edited by Kim W. Woods (London: Tate Publishing, 2012), 134. 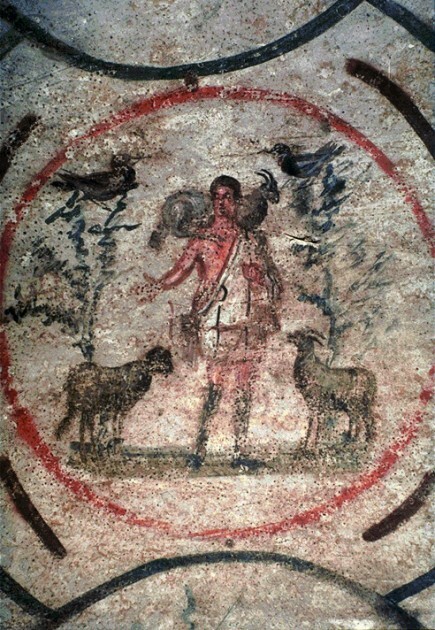 Anyone with a basic knowledge of Early Christian art is probably familiar with depictions of Christ as the Good Shepherd. In this imagery, Christ appears as a beardless youth, often carrying a lamb on his shoulders. 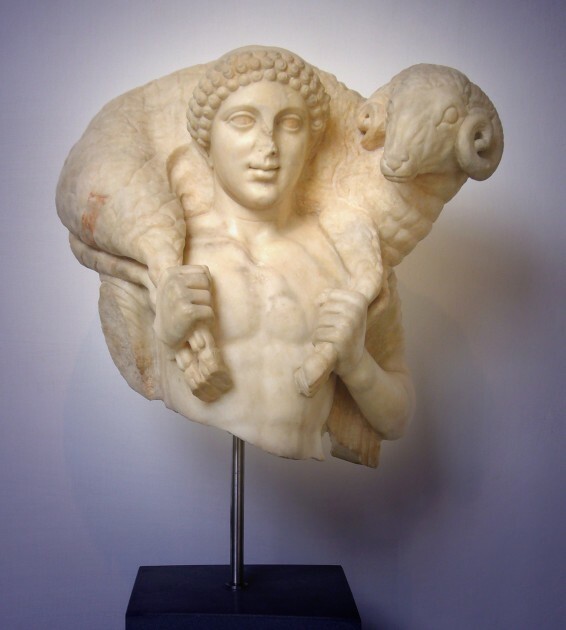 It’s common for art historians to draw connections between these depictions of Christ and Apollo, or even to point out how earlier classical statues (like the Moschophoros from the acropolis in Athens) may have served as prototypes for the Good Shepherd imagery. Ramsey wrote this short article almost thirty years ago, but I think that he has presented some valid ideas. Do you know of some other theories regarding the disappearance of the Good Shepherd iconography? What depictions of the Good Shepherd do you like best? 1 Boniface Ramsey, “A Note on the Disappearance of the Good Shepherd in Art,” The Harvard Theological Review 76, no. 3 (July 1983): 375-378. 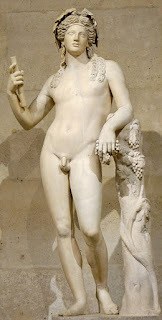 I was recently asked a question something like, “If you had to choose a favorite god or goddess from ancient Greek/Roman mythology, who would it be?” I quickly answered Bacchus (Dionysus), the god of wine. It’s not because I’m into bacchanalian parties (I don’t even drink!) 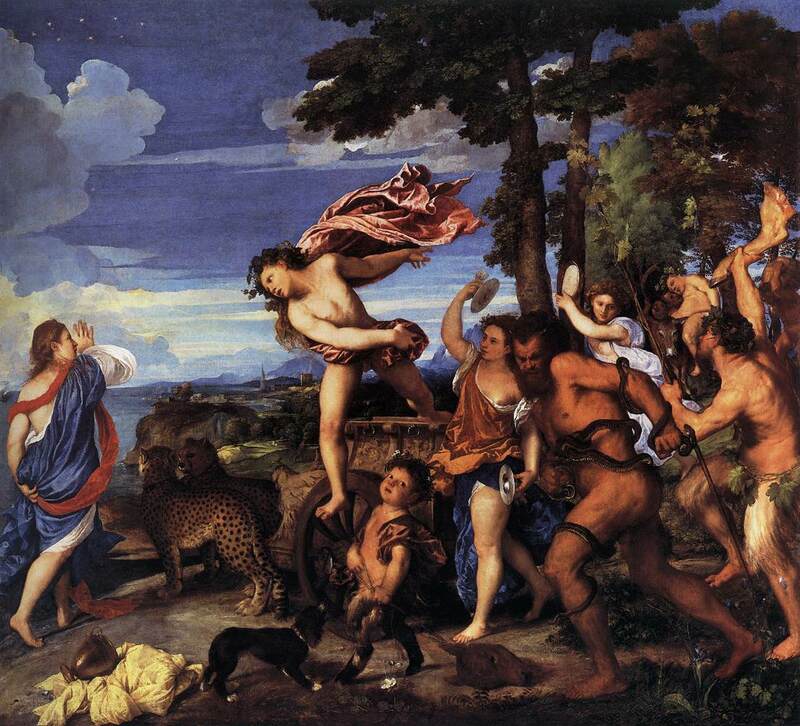 or Dionysiac cults, but Bacchus just seems like he’d be a really entertaining friend. I bet that guy can be funny-on-command. 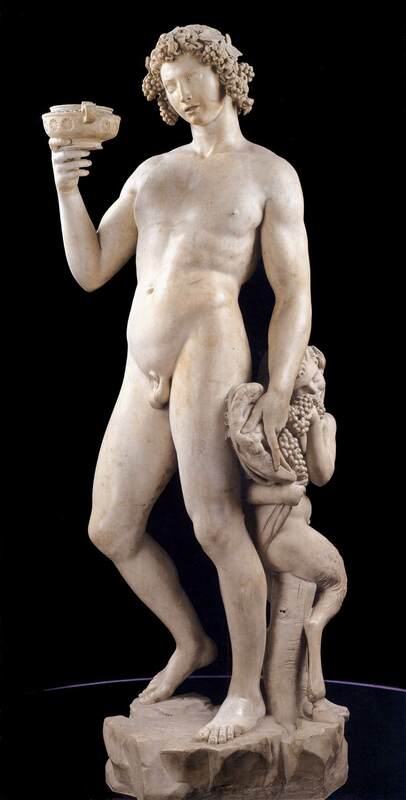 Anyhow, I started to think of all of the depictions of Bacchus/Dionysus in art. 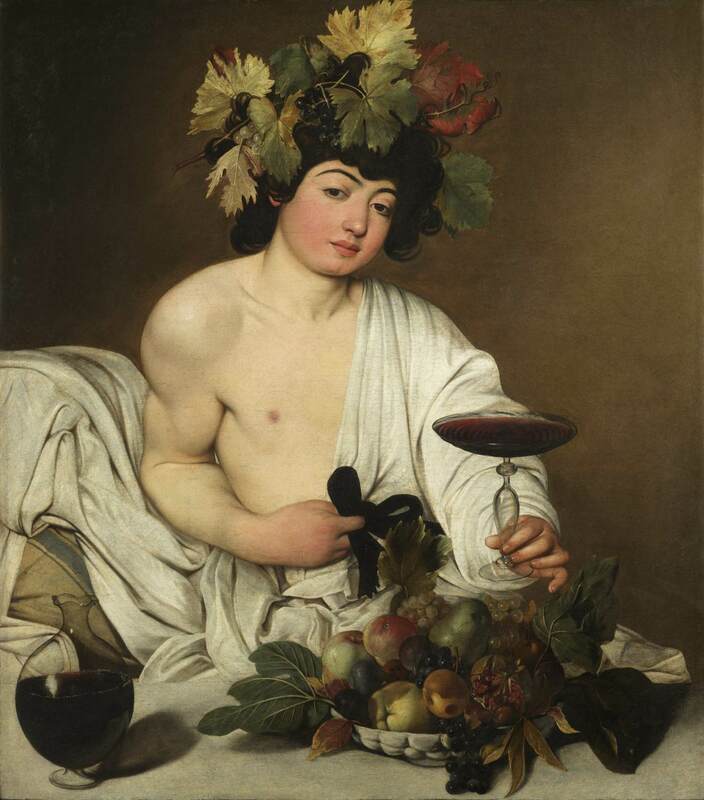 Since my speciality is in 17th century art, it’s not surprising that I first thought of art created in the Renaissance/Baroque periods: Michelangelo’s Bacchus (1497), Caravaggio’s Bacchus (c. 1596), Caravaggio’s Sick Bacchus (c. 1593), Velazquez’ The Triumph of Bacchus (c. 1629; see detail above), and Titian’s Bacchus and Ariadne (1520-22). 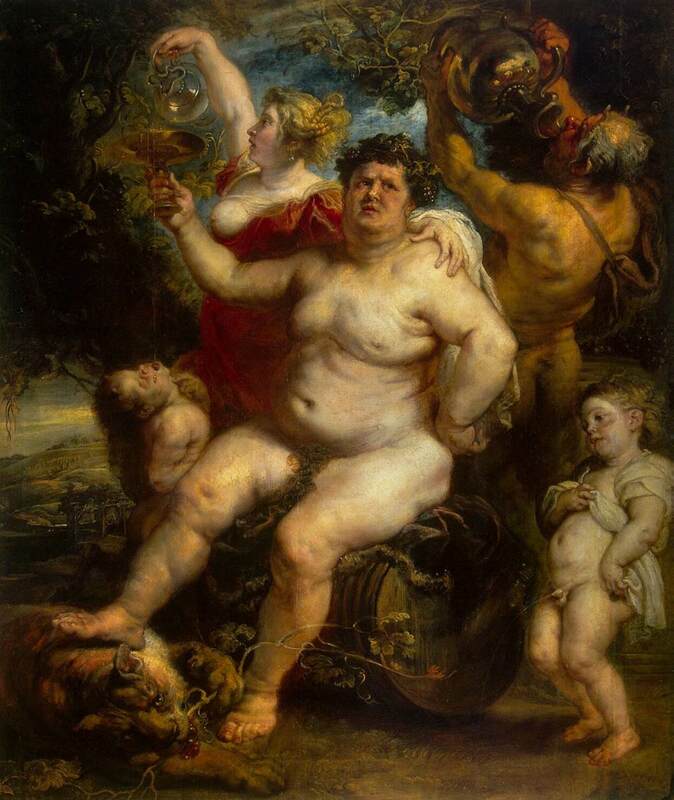 While researching for this post, I also came across a fun depiction of a hefty Bacchus (1638-40) by Rubens. 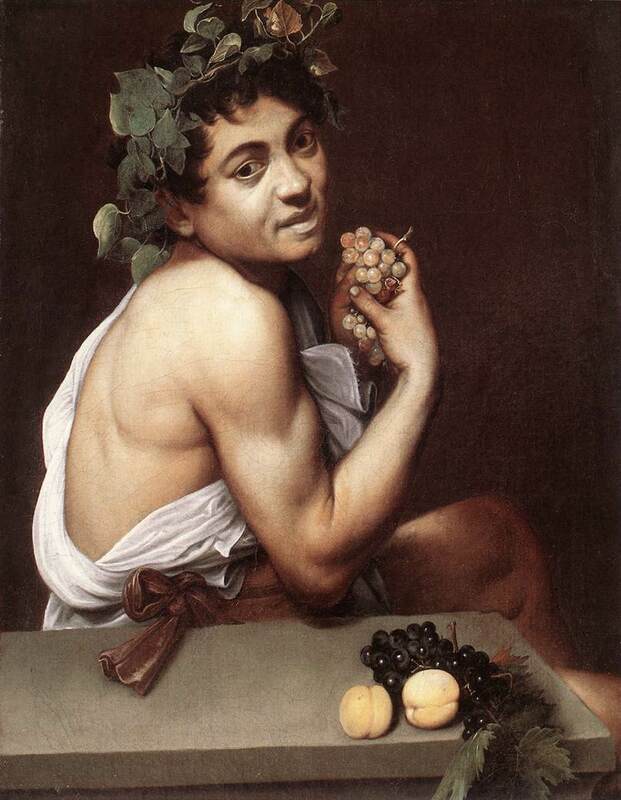 I think it might be my new favorite Bacchus painting, partially because the god’s face and girth remind me of a physics teacher from my old high school. 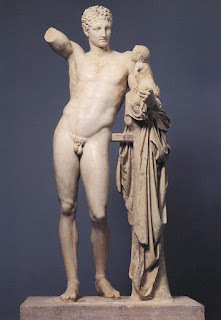 According to mythology, Dionysus was born out of Zeus’ thigh. 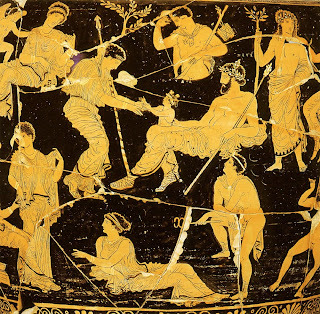 I love this vase painting – check out Dionysus’ cute lil’ postnatal wreath! 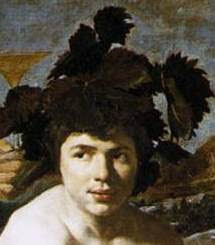 There are a lot more depictions of Bacchus/Dionysus than the few I’ve shown here. 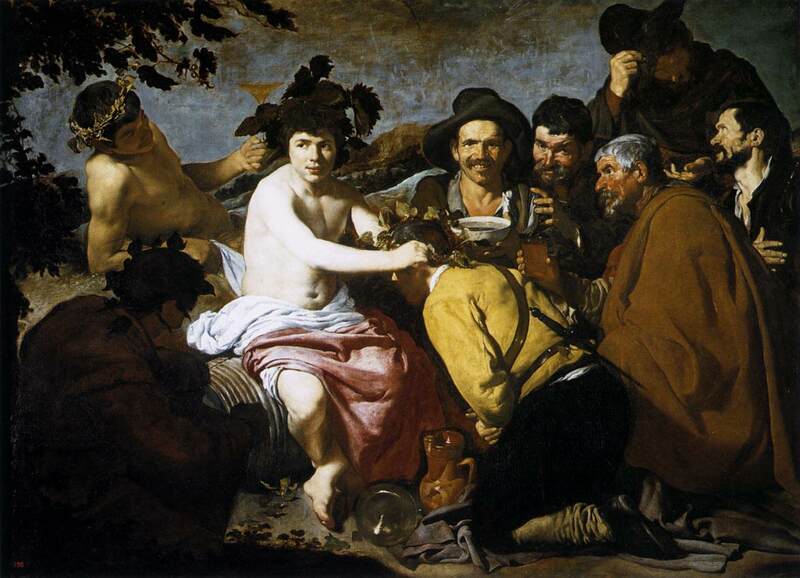 Do you have a favorite depiction of the god of wine? 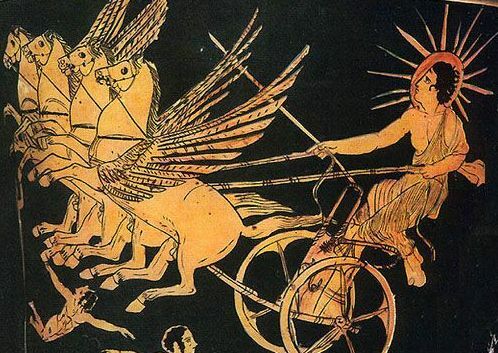 If you had to pick a favorite god or goddess from classical mythology, who would it be? 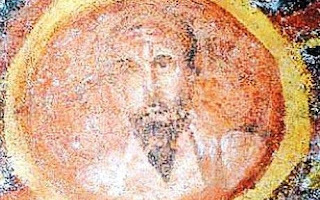 I just read this post which informed me that a new catacomb painting of St. Paul has been found in Rome. 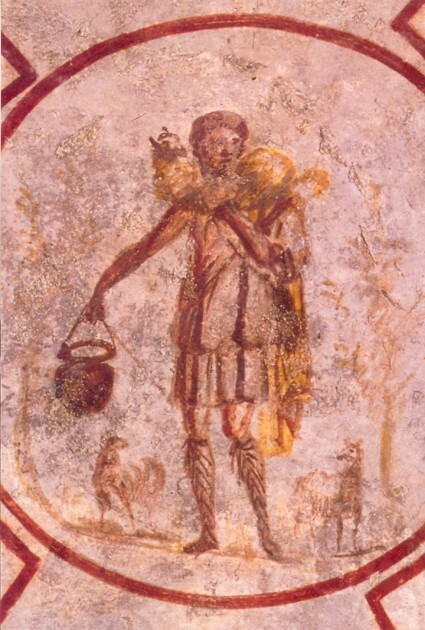 This is the oldest extant fresco of St. Paul, which dates to the 4th century AD. Plus, this discovery is also exciting because of all of the images of St. Paul from the Early Christian period, this one is in the best condition. This fresco was discovered in the Catacomb of St. Thekla. The catacomb is near the place where Paul was reportedly buried (the Basilica of St Paul’s Outside-the-Walls in Rome). This fresco was instantly recognized as St. Paul since the thin face and dark beard were typical iconographic features for the saint in the 4th century. You can read more about the fresco’s discovery in yesterday’s Telegraph article. Along these same lines, today’s Telegraph article discusses test results which confirm that the remains located in St. Paul’s Outside-the-Walls belong to St. Paul. (Well, probably. The remains have been confirmed to date from the first or second century.) It appears that the finding of this fresco prompted officials to test the remains inside the sarcophagus. Pretty cool stuff. I think it’s especially interesting that this fresco was restored using a laser. Technology is helping archaeologists and restorers do some amazing stuff. 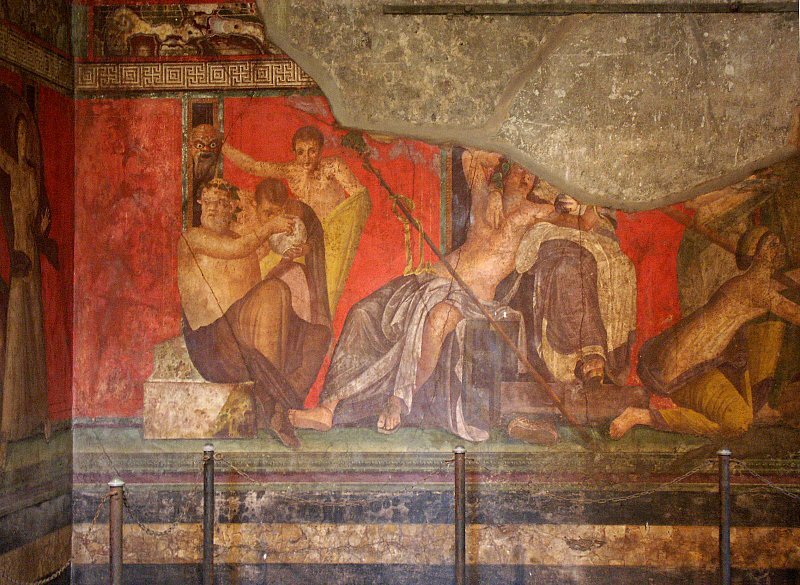 If lasers were never invented, do you think this fresco would have been lost forever?